"There's a lot of... *wheeze* running and... *wheeze* jumping, isn't it?" A Platform Game or Platformer is a subgenre of Action Game characterized by gameplay dominated by jumping between platforms of varying heights while avoiding enemies and obstacles. As a rule, Player Characters in a platformer can jump really high and, are usually able to change direction in mid-air to correct their trajectory. Climbing, swinging, and other acrobatic maneuvers may also be utilized to get around. Bottomless Pits and other kinds of pit traps are common hazards. In the traditional 2D platformer, play progresses from left to right, though many of the older games only allowed movement in one direction. Early platform games evolved out of arcade games like Space Panic (1980) (which had platforming through climbing ladders, but no jumping) and Donkey Kong, released a year later, which added the ability to jump between platforms and over obstacles. Many early platformers had a single static screen, with a common goal being to either reach the top of the stage or collect all of a certain item. 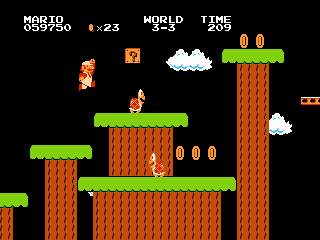 Jump Bug was the first game to use side-scrolling levels. 1984 saw the release of Pac Land, a game that would serve as inspiration for the game that would popularize the platformer, Super Mario Bros..
Super Mario Bros. popularized the idea of defeating enemies by jumping directly on them, and many other platformers have followed suit. However, the presence of this trope isn't necessary for a game to be considered a platformer, as games such as Metroid, Jak and Daxter, Ratchet & Clank, Castlevania, and the Mega Man series are still characterized as platformers because they have a dedicated jump button and jumping is still a large part of the gameplay. Games where the player is given a firearm and emphasis is put on such weapons are known as "run-and-gun" games, with some famous examples being Contra and Metal Slug. Although they are often associated with the Shoot 'em Up genre, the player is still bound by gravity and often jumps across platforms, so they are still platform games in a strong sense of the word (sometimes called "action platformers"). 3D platformers are almost always rendered in the third person, as with Super Mario 64 and Crash Bandicoot (1996), but Metroid Prime and its sequels are considered by many to be hybrids of the 3D Platformer and the First-Person Shooter (with Metroidvania elements, of course). Pure first-person platforming tends to be rather uncommon, due to not being able to see where your feet may touch the ground, but it's not impossible to pull off well; see Jumping Flash! and Mirror's Edge. Like most game genres, platformers are steadily evolving with the times; they started as linear obstacle courses, but gradually became less linear, with multiple level paths, playable overworld areas, and/or map screens with different routes; eventually, the genre even began taking inspiration from Action-Adventure games, creating the Metroidvania genre. The jump to 3D brought the 'collectathon' sub-genre popularized by Super Mario 64 which featured non-linear open worlds with a greater emphasis on exploration. The first few were fine, but gamers eventually began to get sick of this. As a result, "collectathon" titles began waning in popularity. As of right now, the genre is in a weird stage of either being based on particular gimmicks, or going back to its roots - in particular New Super Mario Bros. and LittleBigPlanet are generally credited with reviving the 2D platforming genre. The former became puzzle games of a sort (eventually becoming prevalent enough to be considered a sub-genre), and the latter tend to be more linear, pure platforming challenges, and spawned the Platform Hell phenomenon. 2D platformers are still being made, due to their accessibility and ease of programming, as independent PC titles, web-based Flash games, and for the various handheld console platforms and cell phones. Subgenres include Cinematic Platform Game (which has a more realistic style), Platform Hell (which is really, really freaking hardnote Let's put it this way - Nintendo Hard is an understatement! - no, seriously), Elimination Platformer, and Puzzle Platformer (which combines elements of Puzzle Games). Jump Physics: At a minimum platformer characters can leap two times their height. Often, they can jump far higher than that and even alter their course in midair. Rule of Three: Extremely common in puzzles and boss fights within this genre, which in turn can lead to Hard Levels, Easy Bosses. Castlevania note Later installments became Action-Adventure Platformers. Then... well, the series helped name the Metroidvania genre. Clonk, among about twenty other genres. Felix the Cat by Dragon Co. The Magic School Bus Explores the Solar Systemnote Technically a mini-game, but needed to progress through the game. Street Fighter X Mega Man note What makes this one an interesting example is that SFxMM is a fan game that was picked up by Capcom for an official release. Spyro: Attack of the Rhynocs.